The pair of scorching SUVs designed to take on the likes of the Porsche Macan Turbo, Mercedes-AMG GLC 63 and mooted Audi RS Q5 made their debut during the DTM touring car race series this weekend at the Nurburgring in Germany, wearing promo sticker packs to hide their designs. Expected to be properly exposed at the 2018 Paris motor show in early October, the turbocharged twins have been hinted at, teased and leaked and now the vehicles have been driven on the race track. No performance specifications have been revealed but according to Frank van Meel, the BMW M division’s boss, the new models will crush their opposition. 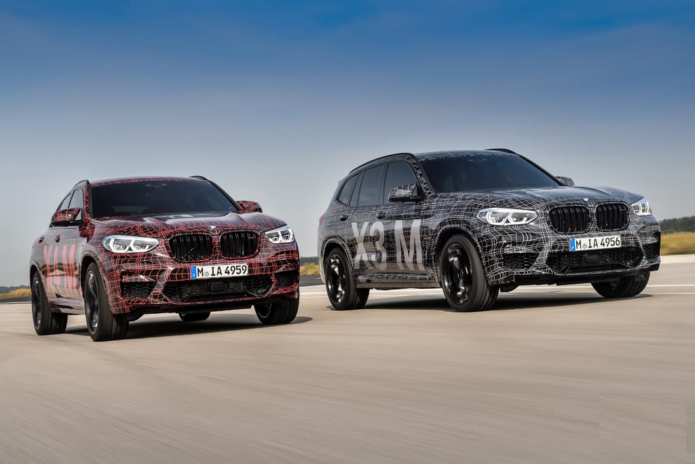 “With their M specific performance characteristics, the BMW X3 M and the BMW X4 M will set benchmarks in terms of dynamics in their respective vehicle segment,” said van Meel. Does that mean a Nurburgring Nordschleife lap record is in the wings? At the very least they should blast from 0-100km/h in under 4.0 seconds. By way of comparison the Mercedes-AMG GLC 63 S dispatches the sprint in just 3.8 seconds. BMW is yet to disclose engine types and power outputs, but a high performance version of the new 3.0-litre turbo-petrol S58 inline six-cylinder engine is most likely. As previously reported, leaked details of the new BMW X4 M reckon it’ll bang out around 340kW and 600Nm. Currently, the standard BMW M3 and M4 models bang out at least 317kW and 550Nm, but there are higher power versions available. The desire and demand for SUVs – and high-performance machinery – in Australia means it’s only a matter of time before both pumped-up M models arrive in local showrooms. “Absolutely, we 100 per cent want these cars,” said Lenore Fletcher, BMW Australia’s corporate communications GM. BMW M division trademarke quad exhaust pipes? Check! “Given Australia’s appetite for SUVs and performance cars, we think these cars would be popular in Australia. “Is the company interested? Absolutely. Is it confirmed? Not yet,” she told motoring.com.au. Once confirmed however, it’s understood the go-fast X3 and X4 models would arrive in Australia in the second half of 2019. After the formality of homologating the cars for Australia is out of the way, the next step will be negotiating specification levels – always fairly generous in Oz – and price. How much would you pay for one of these? The Mercedes-AMG GLC 63 S is priced at $165,000 and $172,000 for the wagon and coupe respectively, which provides a rough guide to BMW X3 M and X4 M pricing. Both the BWW X4 M coupe and BMW X3 M wagon will be all-wheel drive and are kitted out with all the M division goodies, such including aerodynamic body work, special suspension, a beefed-up driveline with M rear axle differential, recalibrated all-wheel drive system and louder, more intense intake and exhaust systems. The BMW X3 M and X4 M reveal comes shortly after the announcement of a couple of other important X models this week, including the BMW X5 45e plug-in hybrid and the BMW X2 M35i.